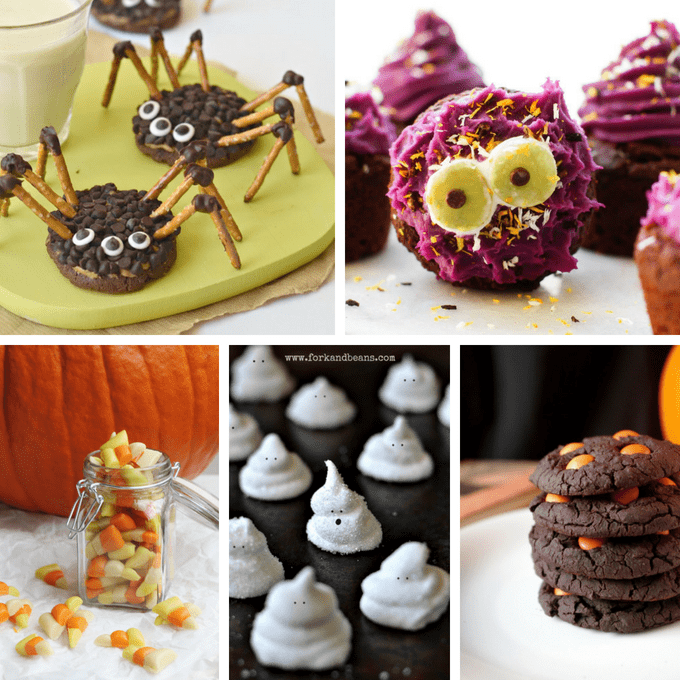 VEGAN HALLOWEEN TREATS: 25 vegan, gluten free Halloween treats. 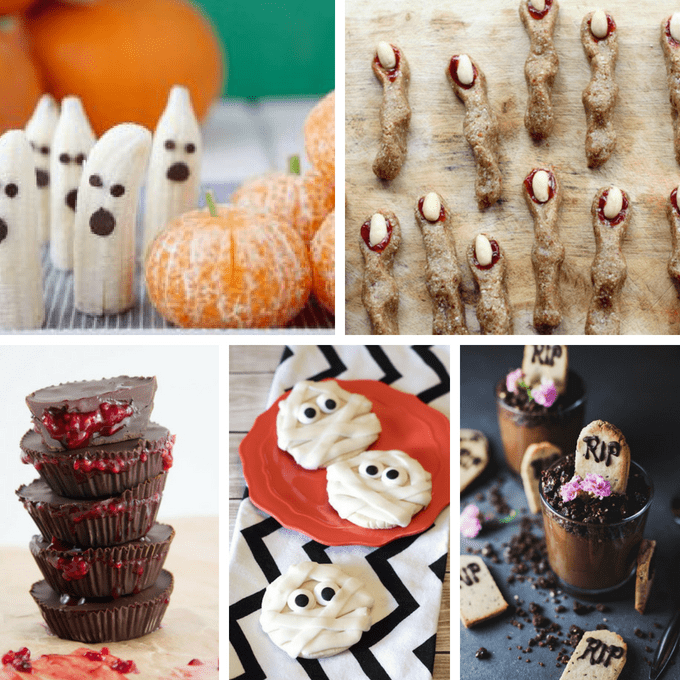 A roundup of 25 gluten free and vegan Halloween treats. 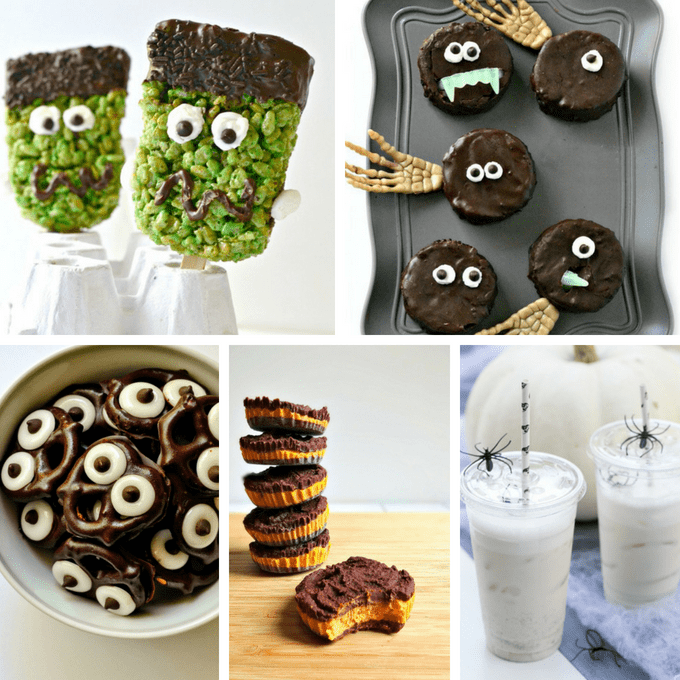 Halloween can be a tricky time when you navigate the world as a vegan or when you have food allergies and sensitivities. Milk chocolate candy abounds! 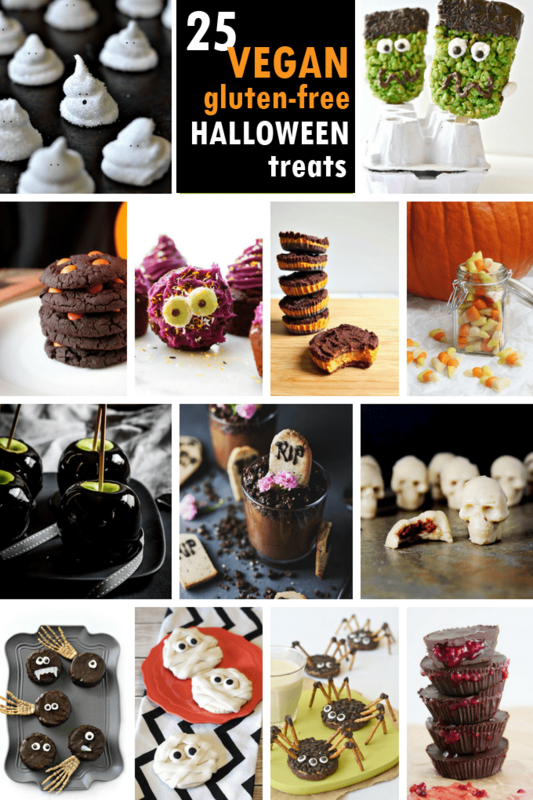 But delicious, clever, vegan Halloween treats about, too. (Psst, for our gluten-free friends, many of these fall in that category, too, so keep your eye out for gluten-free treats). Find Frankenstein rice cereal treats at Fork and Beans. More from this great site. Ding Dong monsters over at Fork and Beans. Wait, one more! Make chocolate-covered pretzels at Fork and Beans. Yum! Make chocolate pumpkin cups at The Glowing Fridge. Make almond milk horchata at Sugar and Charm. Make spider cookies at Fork and Beans. Make monster cupcakes at Feasting on Fruit. Make vegan candy corn at the Free People blog. Make vegan ghost peeps at Fork and Beans. 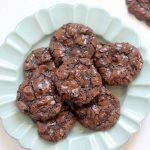 Make some black bean chocolate Halloween cookies at Nutritionist in the Kitch. Make banana ghosts and tangerine pumpkins at Weelicious. Make some seriously creepy vegan witch fingers at Choosing Raw. Make bloody chocolate cups at elephantastic vegan. 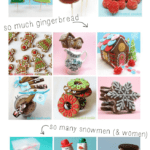 Make mummy cookies at Sarah Bakes. Make Nakd graveyard cups at Wallflower Kitchen. 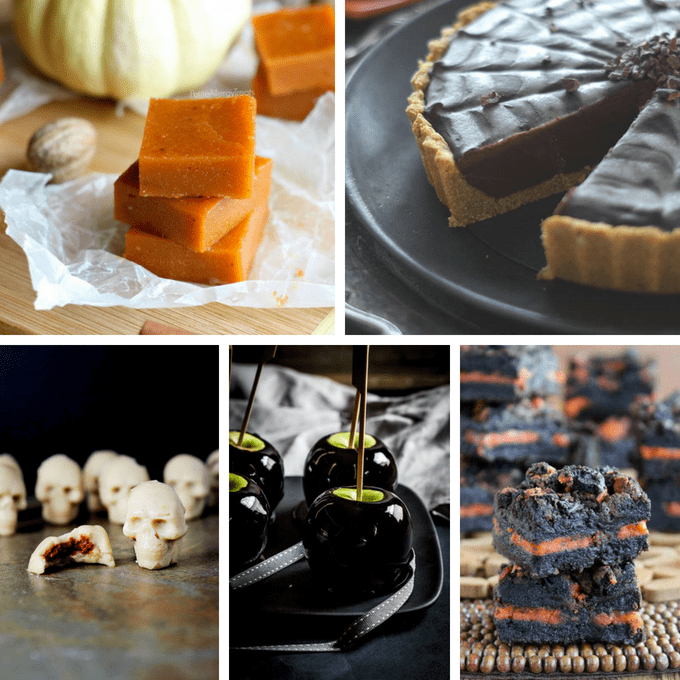 Make vegan, gluten-free pumpkin fudge at Petite Allergy Treats. Oh divine. Make a chocolate pumpkin tart at Unconventional Baker. Try skull candy made with cashews at Wallflower Girl. Make poison apples at Simply Delicious. Make oreo brownies at Vegan in the Freezer. 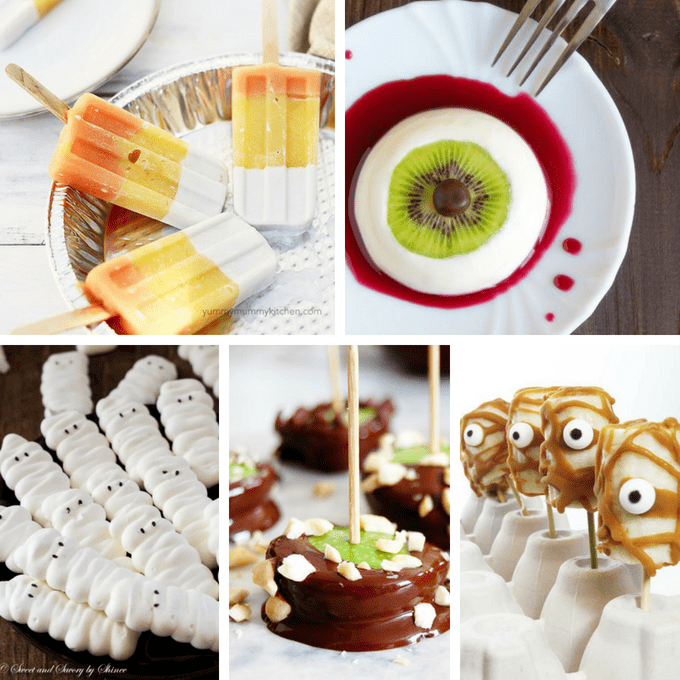 Make candy corn ice pops at Yummy Mummy Kitchen. Make eyeball panna cotta at Nerdy Mamma. Make gluten-free (not vegan) mummy meringue cookies at Sweet and Savory by Shinee. Make healthy apple bites at Paleo Grub. Make banana mummies at Lexie’s Kitchen. And by the way, make vegan googly eyes at Fork and Beans.